Devotees of this unusual variety are enamoured by its attractive purplish-blue cast, strong growth habit, and sweet camphor scent. 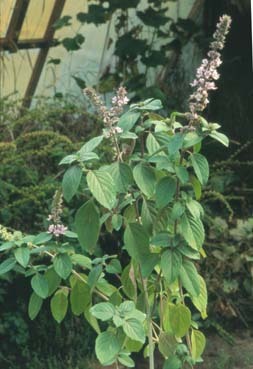 Leaf veins, flower spikes and stems are purple while the rest is green. The hint of camphor is a little off-putting t first, but the unusual flavour and odour definitely grows on you. Hybrid between dark opal and camphor basils.